Google ! Google !! Google !!! The name always ring in my mind whenever i hear it, not only me. Many internet users today also feel the same way at times even if not every time, believe me - if we say Microsoft is the father of Computer then Google is the father of the Internet too. +Google has changed the way the internet used to be in a very positive way. But, there is a lot more to know about Google than just the name 'Google' itself. What do i have to know, you are wondering ? Well, sit down and relax as we go through the full details of what Google is all about. Google Inc. is an American multinational corporation specializing in Internet-related services and products. These Internet-related services and products include search, cloud computing, software, online advertising and outstanding technologies. 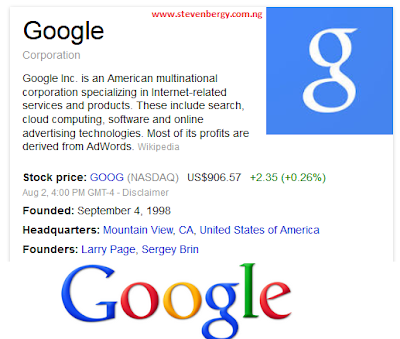 Google was founded by Larry Page and Sergey Brin while they were Ph.D. students at Stanford University. Larry and Sergey own about 16 percent of Google's share so they incorporated Google as a private company on September 4, 1998. Later on, Google stated its mission in a gathering, saying their aim is "to organize the world's information and make it universally accessible and useful". In 2006, Google moved to their headquarters in Mountain View, California, nicknamed the Googleplex. Presently, Google offers online productivity tools which includes email (Gmail), an office suite (Google Docs), and social networking (Google+). Their Desktop Applications include web browser, photo editor, organizer and Instant Messaging App. Google is also leading the development of the Android mobile operating system and the browser-only Google Chrome OS for a specialized type of PC known as Chromebook. Google has moved increasingly into communications hardware: partnering with major electronics manufacturers e.g. ASUS, in production of its high-end Nexus Tablets and Smartphones. In total, Google has been estimated to run more than one million servers in data centers around the world and to process over one billion search requests and about twenty-four Petabytes of user-generated data each day. In December 2012, Alexa listed www.google.com as the most visited website in the world. Numerous Google sites in other languages figure in the top one hundred, and several other Google-owned sites such as YouTube and Blogger. Google started with Larry Page and Sergey Brin, but now it already has thousands of workers worldwide. What more success story can be greater than Google's ? What do you think about Google ? Would you like to also contribute to the hard work of Google which is stylishly changing the technological advancement of this century ? Lets hear from you ! Don't forget to share this informative post with your friends.